How Active and Passive FTP mode works. 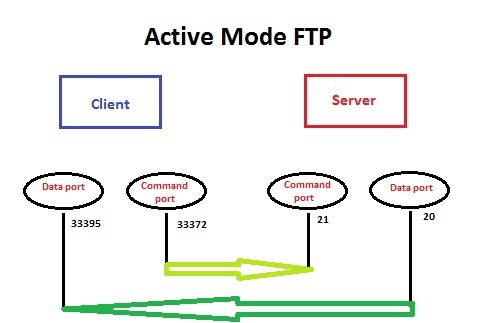 I have been always wondering whats the easy way to understand how Active & Passive mode FTP connections work. So, after referring a lot of sites, I came up with this one on how they works briefly, so that you can get to know the basic differences. If you are trying to learn deep into how this works at the packet level, I am sorry this is not the right place for you. A user connects from a random port(33372) on a file transfer client to port 21 on the server. It sends the PORT command, specifying what client-side port(33395) the server should connect to. This port will be used later on for the data channel and is different from the port used in this step for the command channel. The server connects from port 20 to the client port designated for the data channel. Once connection is established, file transfers are then made through these client and server ports. 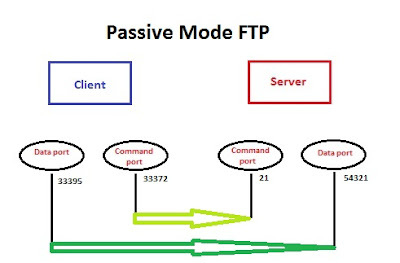 In passive mode, the client still initiates a command channel from port(33372) to server's port 21. However, instead of sending the PORT command, it sends the PASV command, which is basically a request for a server port to connect to for data transmission. When the FTP server replies, it indicates what port number(54321) it has opened for the ensuing data transfer. Summarized steps below. The client connects from another random port(33395) to the random port specified in the server's response. Once connection is established, data transfers are made through these client and server ports. 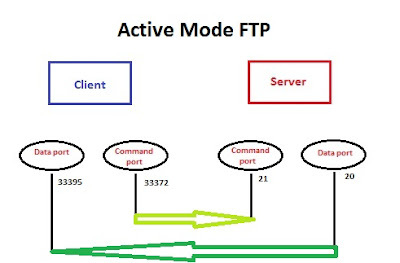 Points to be Noted: In an active mode connection, the server will attempt to connect to a random client-side port. So chances are, that port wouldn't be one of those predefined ports. As a result, an attempt to connect to it will be blocked by the firewall and no connection will be established. Of course, it could be also possible for the server side to have a firewall as well. However, since the server is expected to receive a greater number of connection requests compared to a client, then it would be but logical for the server admin to adapt to the situation and open up a selection of ports to satisfy passive mode configurations. Let me know if I should correct anything here. TCP/IP is based on a four-layer reference model. All protocols that belong to the TCP/IP protocol suite are located in the top three layers of this model. As shown in the following diagram, each layer of the TCP/IP model corresponds to one or more layers of the seven-layer Open Systems Interconnection (OSI) reference model proposed by the International Organization for Standardization (ISO). The types of services performed and protocols used at each layer within the TCP/IP model are described in more detail below. 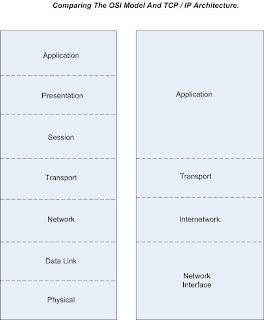 Application: Defines TCP/IP application protocols and how host programs interface with transport layer services to use the network. Transport: Provides communication session management between host computers. 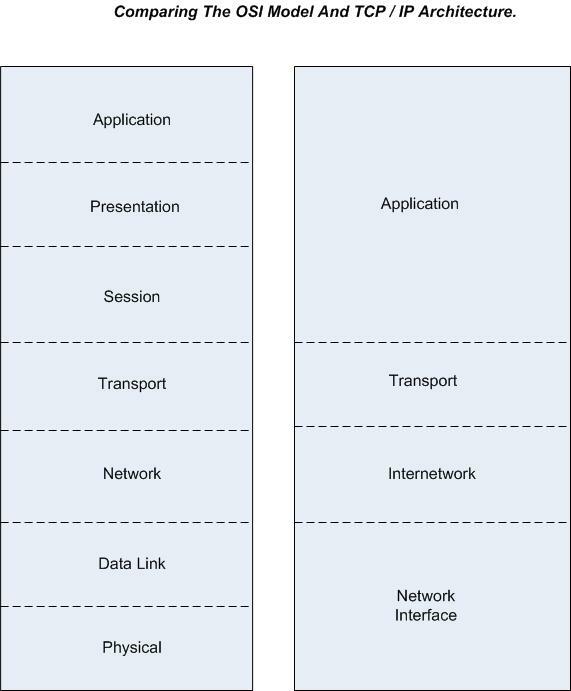 Defines the level of service and status of the connection used when transporting data. Internetwork: Packages data into IP datagrams, which contain source and destination address information that is used to forward the datagrams between hosts and across networks. Performs routing of IP datagrams. Network Interface: Specifies details of how data is physically sent through the network, including how bits are electrically signaled by hardware devices that interface directly with a network medium, such as coaxial cable, optical fiber, or twisted-pair copper wire. The TCP/IP model and related protocols are maintained by the Internet Engineering Task Force (IETF). A HTTP-based SSL connection is always initiated by the client using a URL starting with https:// instead of with http://. At the beginning of an SSL session, an SSL handshake is performed. This handshake produces the cryptographic parameters of the session. A simplified overview of how the SSL handshake is processed is shown in the diagram below. The client sends a client "hello" message that lists the cryptographic capabilities of the client (sorted in client preference order), such as the version of SSL, the cipher suites supported by the client, and the data compression methods supported by the client. The message also contains a 28-byte random number. The server responds with a server "hello" message that contains the cryptographic method (cipher suite) and the data compression method selected by the server, the session ID, and another random number. The client and the server must support at least one common cipher suite, or else the handshake fails. The server generally chooses the strongest common cipher suite. The server sends its digital certificate. (In this example, the server uses X.509 V3 digital certificates with SSL. )If the server uses SSL V3, and if the server application (for example, the Web server) requires a digital certificate for client authentication, the server sends a "digital certificate request" message. In the "digital certificate request" message, the server sends a list of the types of digital certificates supported and the distinguished names of acceptable certificate authorities. The server sends a server "hello done" message and waits for a client response. Upon receipt of the server "hello done" message, the client (the Web browser) verifies the validity of the server's digital certificate and checks that the server's "hello" parameters are acceptable.If the server requested a client digital certificate, the client sends a digital certificate, or if no suitable digital certificate is available, the client sends a "no digital certificate" alert. This alert is only a warning, but the server application can fail the session if client authentication is mandatory. The client sends a "client key exchange" message. This message contains the pre-master secret, a 46-byte random number used in the generation of the symmetric encryption keys and the message authentication code (MAC) keys, encrypted with the public key of the server.If the client sent a digital certificate to the server, the client sends a "digital certificate verify" message signed with the client's private key. By verifying the signature of this message, the server can explicitly verify the ownership of the client digital certificate. An additional process to verify the server digital certificate is not necessary. If the server does not have the private key that belongs to the digital certificate, it cannot decrypt the pre-master secret and create the correct keys for the symmetric encryption algorithm, and the handshake fails. The client uses a series of cryptographic operations to convert the pre-master secret into a master secret, from which all key material required for encryption and message authentication is derived. Then the client sends a "change cipher spec" message to make the server switch to the newly negotiated cipher suite. The next message sent by the client (the "finished" message) is the first message encrypted with this cipher method and keys. The server responds with a "change cipher spec" and a "finished" message of its own. The SSL handshake ends, and encrypted application data can be sent. By looking at the addressing structures, you can see that even with a Class C address, there are a large number of hosts per network. Such a structure is an inefficient use of addresses if each end of a routed link requires a different network number. It is unlikely that the smaller office LANs would have that many devices. You can resolve this problem by using a technique known as subnet addressing. Subnet addressing allows us to split one IP network address into smaller multiple physical networks known as subnetworks. Some of the node numbers are used as a subnet number instead. A Class B address gives us 16 bits of node numbers translating to 64,000 nodes. Most organizations do not use 64,000 nodes, so there are free bits that can be reassigned. Subnet addressing makes use of those bits that are free, as shown below. A Class B address can be effectively translated into multiple Class C addresses. For example, the IP address of 172.16.0.0 is assigned, but node addresses are limited to 255 maximum, allowing eight extra bits to use as a subnet address. The IP address of 172.16.97.235 would be interpreted as IP network address 172.16, subnet number 97, and node number 235. In addition to extending the number of addresses available, subnet addressing provides other benefits. Subnet addressing allows a network manager to construct an address scheme for the network by using different subnets for other geographical locations in the network or for other departments in the organization. Although the preceding example uses the entire third octet for a subnet address, note that you are not restricted to octet boundaries in subnetting. To create more network numbers, you need only shift some bits from the host address to the network address. For instance, to partition a Class C network number (192.68.135.0) into two, you shift one bit from the host address to the network address. The new netmask (or subnet mask) is 255.255.255.128. The first subnet has network number 192.68.135.0 with hosts 192.68.135.1 to 129.68.135.126, and the second subnet has network number 192.68.135.128 with hosts 192.68.135.129 to 192.68.135.254. Note: The number 192.68.135.127 is not assigned because it is the broadcast address of the first subnet. The number 192.68.135.128 is not assigned because it is the network address of the second subnet. Because TCP/IP networks are interconnected across the world, each computer on the Internet must have a unique address (called an IP address) to make sure that transmitted data reaches the correct destination. Blocks of addresses are assigned to organizations by the internet Assigned Numbers Authority (IANA). Individual users and small organizations may obtain their addresses either from the IANA or from an Internet service provider (ISP). You can contact IANA at http://www.iana.org. The Internet Protocol (IP) uses a 32-bit address structure. The address is usually written in dot notation (also called dotted-decimal notation), in which each group of eight bits is written in decimal form, separated by decimal points. on a network. Each address type begins with a unique bit pattern, which is used by the TCP/IP software to identify the address class. After the address class has been determined, the software can correctly identify the host section of the address. The figure below shows the three main address classes, including network and host sections of the address for each address type. Class E addresses are for experimental use. This addressing structure allows IP addresses to uniquely identify each physical network and each node on each physical network. For each unique value of the network portion of the address, the base address of the range (host address of all zeros) is known as the network address and is not usually assigned to a host. Also, the top address of the range (host address of all ones) is not assigned, but is used as the broadcast address for simultaneously sending a packet to all hosts with the same network address. In each of the address classes previously described, the size of the two parts (network address and host address) is implied by the class. This partitioning scheme can also be expressed by a netmask associated with the IP address. A netmask is a 32-bit quantity that, when logically combined (using an AND operator) with an IP address, yields the network address. For instance, the netmasks for Class A, B, and C addresses are 255.0.0.0, 255.255.0.0, and 255.255.255.0, respectively. As a shorter alternative to dotted-decimal notation, the netmask may also be expressed in terms of the number of ones from the left. This number is appended to the IP address, following a backward slash (/), as “/n.” In the example, the address could be written as 192.168.170.237/24, indicating that the netmask is 24 ones followed by 8 zeros. Link To download this Doc.